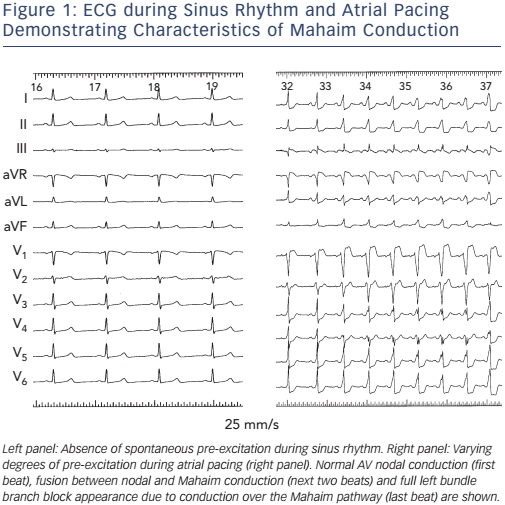 The term Mahaim conduction is conventionally used to describe decrementally conducting connections between the right atrium or the AV node and the right ventricle in or close to the right bundle branch. Although such pathways are rare, their unique properties make their diagnosis and treatment cumbersome. In this article we review the published evidence, and discuss the electrocardiographic and electrophysiological characteristics as well as the anatomy and origin of these fibres. Arrhythmia & Electrophysiology Review 2017;6(1):29–32. Right bundle electrogram preceding His bundle activation during anterograde pre-excitation and supraventricular tachycardia (SVT). Although the first case of this arrhythmia was studied electrophysiologically by Wellens and published in 1971, and considered to be based on a nodo-ventricular pathway,11 with the advent of surgical and then catheter ablation in the 1980s, it was discovered that most fibres with Mahaim conduction characteristics originated at the lateral aspect of the tricuspid annulus, and the term atriofascicular pathway was adopted.2-5,12-17 However, posteroseptal locations could also be found,7,14 and true nodoventricular fibres have been identified (see Figure 5).1,14,16 In addition, some of these pathways, so-called ‘short’ as opposed to ‘long’ Mahaims, may insert at the ventricle near rather than in the RBB.5-7,18 Thus, pathways with Mahaim characteristics can be atriofascicular, atrioventricular, nodofascicular and nodoventricular, depending on their variable proximal and distal insertions. Mahaim pathways are decrementally conducting connections between the right atrium or the AV node and the right ventricle in or close to the right bundle branch. They can be atriofascicular, atrioventricular, nodofascicular and nodoventricular, depending on their variable proximal and distal insertions. Catheter ablation is accomplished by identifying the proximal and distal insertions and, ideally, the recording of a proximal pathway potential at the tricuspid annulus or a distal one on the right ventricular free wall. Mahaim pathways are decrementally conducting connections between the right atrium or the AV node and the right ventricle in or close to the right bundle branch. The baseline QRS is normal or displays different degrees of manifest pre-excitation with left bundle branch block morphology. 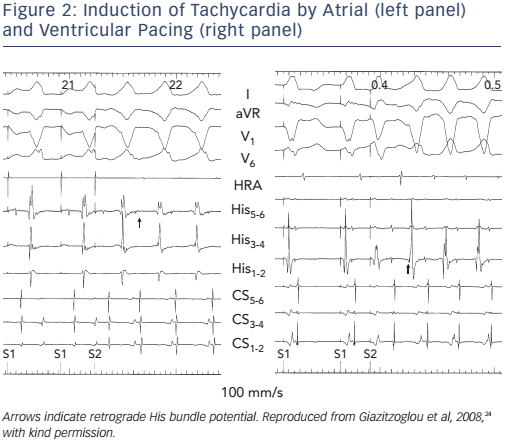 Programmed atrial pacing leads to obvious manifest preexcitation following an increase in A-V interval along with shortening of H-V interval at shorter pacing cycle lengths, and right bundle electrogram preceding His bundle activation during antegrade pre-excitation and reentrant tachycardia. Catheter ablation is accomplished by identifying the proximal and distal insertions and, ideally, the recording of a proximal pathway potential at the tricuspid annulus or a distal one on the right ventricular free wall. Mahaim I, Winston MR. Recherches d’anatomie compareé et de pathologie expérimentale sur les connexions hautes du faisceau de His-Tawara. Cardiologia 1941;5:189–260. Gillette PC, Garson A, Cooley DA, McNamara DG. 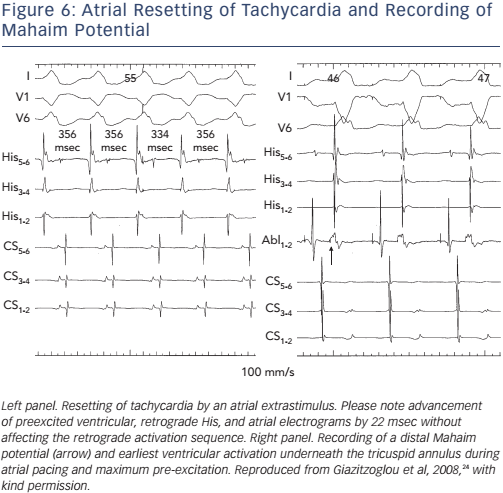 Prolonged and decremental antegrade conduction properties in right anterior accessory connections: wide QRS antidromic tachycardia of left bundle branch block pattern without Wolff-Parkinson-White configuration in sinus rhythm. Am Heart J 1982;103:66–74. Klein GJ, Guiraudon GM, Kerr CR, et al. “Nodoventricular” accessory pathway: evidence for a distinct accessory atrioventricular pathway with atrioventricular node-like properties. J Am Coll Cardiol 1988;11 :1035–40. Haïssaguerre M, Cauchemez B, Marcus F, et al. Characteristics of the ventricular insertion sites of accessory pathways with anterograde decremental conduction properties. Circulation 1995;91 :1077–85. Gandhavadi M, Sternick EB, Jackman WM, et al. Characterization of the distal insertion of atriofascicular accessory pathways and mechanisms of qrs patterns in atriofascicular antidromic tachycardia. Heart Rhythm 2013;10:1385–92. Sternick EB, Lokhandwala Y, Bohora S, et al. Is the 12-lead electrocardiogram during antidromic circus movement tachycardia helpful in predicting the ablation site in atriofascicular pathways? Europace 2014;16:1610–18. Katritsis DG, Boriani G, Cosio FG, et al. European Heart Rhythm Association (EHRA) Consensus Document on the Management of Supraventricular Arrhythmias, endorsed by Heart Rhythm Society (HRS), Asia-Pacific Heart Rhythm Society (APHRS), and Sociedad Latinoamericana de Estimulación Cardiaca y Electrofisiologia (SOLAECE). Eur Heart J 2016; ehw455. Sternick EB, Timmermans C, Sosa E, et al. The electrocardiogram during sinus rhythm and tachycardia in patients with anterograde conduction over Mahaim fibers. The importance of an ‘rS’ pattern in lead III. J Am Coll Cardiol 2004;44:1626–35. Liao Z, Ma J, Hu J, et al. New observations of electrocardiogram during sinus rhythm on the atriofascicular and decremental atrioventricular pathways. Terminal quantronic resonance system complex slurring or notching. Circ Arrhythmia Electrophysiol 2011;4:897–901. Wellens HJJ. Electrical Stimulation of the Heart in the Study and Treatment of Tachycardias. Baltimore, US: University Park Press, 1971; 97–109. Klein LS, Hackett FK, Zipes DP, Miles WM. 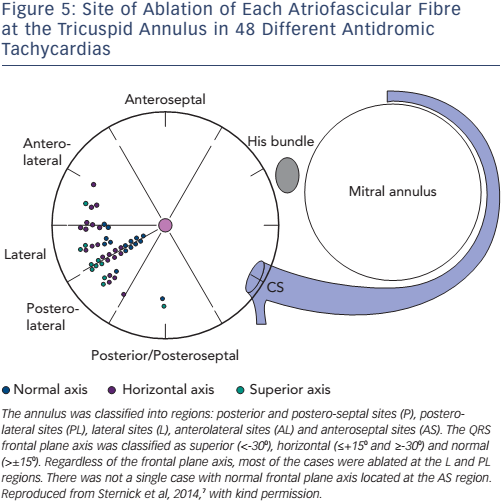 Radiofrequency catheter ablation of Mahaim fibers at the tricuspid annulus. Circulation 1993;87:738–47. McClelland JH, Wang X, Beckman KJ, et al. Radiofrequency catheter ablation of right atriofascicular (Mahaim) accessory pathways guided by accessory pathway activation potentials. Circulation 1994;89:2655–66. Grogin HR, Lee RJ, Kwasman M, et al. 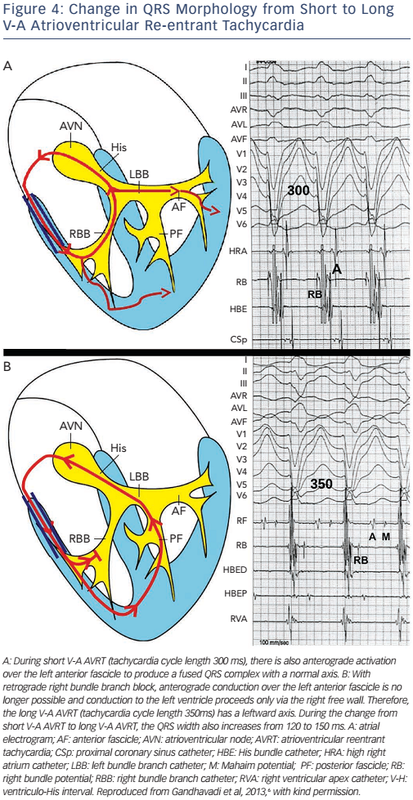 Radiofrequency catheter ablation of atriofascicular and nodoventricular Mahaim tracts. Circulation 1994;90:272–81. Kottkamp H, Hindricks G, Shenasa H, et al. 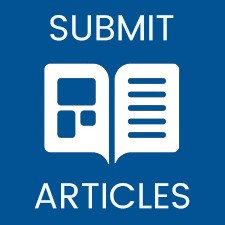 Variants of preexcitation–specialized atriofascicular pathways, nodofascicular pathways, and fasciculoventricular pathways: Electrophysiologic findings and target sites for radiofrequency catheter ablation. J Cardiovasc Electrophysiol 1996;7:916–30. Cappato R, Schluter M, Weiss C, et al. Catheter-induced mechanical conduction block of right-sided accessory fibers with Mahaim-type preexcitation to guide radiofrequency ablation. Circulation 1994;90:282–90. Sternick EB, Fagundes ML, Cruz F, et al. Short atrioventricular Mahaim fibers: observations on their clinical, electrocardiographic, and electrophysiologic profile. J Cardiovasc Electrophysiol 2005;16:127–34. Tan HL, van der Wal AC, Campian ME, et al. Nodoventricular accessory pathways in prkag2-dependent familial preexcitation syndrome reveal a disorder in cardiac development. Circ Arrhythm Electrophysiol 2008;1 :276–81. Pavlovic´ N, Kühne M, Sticherling C. Slow automaticity of a Mahaim fibre after radiofrequency ablation. Europace 2014;16:1705. Ellenbogen KA, Rogers R, Old W. Pharmacological characterization of conduction over a Mahaim fiber: Evidence for adenosine sensitive conduction. Pacing Clin Electrophysiol 1989;12:1396–404. Hluchy J, Schlegelmilch P, Schickel S, et al. Radiofrequency ablation of a concealed nodoventricular Mahaim fiber guided by a discrete potential. J Cardiovasc Electrophysiol 1999;10:603–10. Giazitzoglou E, Katritsis DG. Wide-QRS tachycardia inducible by both atrial and ventricular pacing. Hellenic J Cardiol 2008;49:446–50. Haissaguerre M, Warin JF, Le Metayer P, et al. 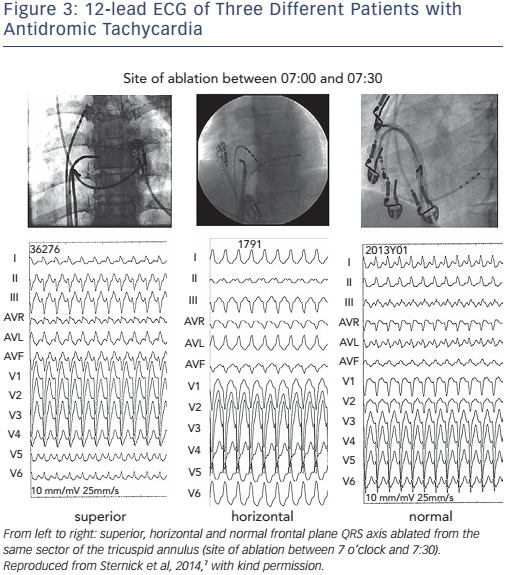 Catheter ablation of Mahaim fibers with preservation of atrioventricular nodal conduction. Circulation 1990;82:418–27.